By the time Computerworld was born in 1967, IBM was well established as the kingpin for computer storage. But over the next five decades, that changed dramatically as new companies rose and fell, storage capacities soared and costs plummeted. When Computerworld was founded in 1967, a 1-megabyte hard drive would have set you back by $1 million. Today, that same megabyte of capacity on a hard disk drive (HDD) costs about two cents. Through those five decades, data storage was seen as little more than a support technology, when in actuality has always been one of five tech pillars -- like processors and software -- underpinning our modern computer systems, said Owen Melroy, vice president of Media Components at Western Digital Corp. (WD). "Without cheap storage, you don't have the internet," Melroy said, referring to hard disk drives. "Without flash memory, there's no smartphone." And, but for a quirk of history, there might never have been hard drives and none of the tech that followed -- at least as we now know it. An IBM 14-in HDD from the early 1980s next to today's highest capacity 3.5-in HDD. The 14-in HDD holds 200MB; the 3.5-in HDD from Western Digital holds 10TB of data or more than 50,000 times the amount of data. To understand how we got from there to here, you have to go back another 10 years before Computerworld was born. The year was 1956 and Reynold Johnson, who'd been sent to open a West Coast research lab for IBM four years earlier, was supervising the 50 engineers he'd hired. The task: Develop a new data recording medium to replace giant bins of punch cards. San Jose, Calif. was chosen because it was warmer and more appealing to young engineering graduates than were IBM's Poughkeepsie, N.Y. labs. Johnson, a former high school science teacher who invented the electronic test scoring machine that sensed No. 2 pencil lead on standardized forms, gave his San Jose-based team a wide development berth. The IBM 350 Disk Storage system was a major component of the IBM 305 RAMAC (Random Access Memory Accounting) system, introduced in September 1956. The 350 Disk Storage system, which weighed about a ton, was made up of a magnetic disk memory unit with its access mechanism, the electronic and pneumatic controls for the access mechanism, and a small air compressor. The 350 was 60 inches long, 68 inches high and 29 inches deep. It contained 50 magnetic disks, rotating at 1,200rpm. and that contained 50,000 sectors, each of which held 100 alphanumeric characters, for a capacity of 5MB of data. "He told each new hire they would have their own assignment. More important than that, they were to keep track of everything going on in the lab and be prepared to help if anyone asked for it," said David Bennet, an engineer who worked on various storage projects for IBM from 1959 through 2014. Bennet, now a guide at the Computer History Museum, said his first assignment at IBM was to work on a direct-access mass storage device for the System/360 mainframe - the 2321 Data Cell Drive. The Cell Drive contained up to 10 removable and interchangeable data cells, each with 200 magnetic strips. At the time, IBM mainframes used both tape drives and drum memory, which consisted of metal cylinders coated with ferromagnetic recording material. Magnetic tape had good capacity, but slow access times; drum memory had great access time, but little capacity. IBM wanted the best of both worlds. Johnson sent down an edict: Storage for IBM's mainframes would be on spinning platters. So his team set about building the IBM 350 Disk Storage Unit -- the world's first hard drive. Created as high-speed storage for the IBM 305 RAMAC system, the IBM 350 weighed about a ton. It was 68 inches tall and 29 inches wide. Though it had to be transported with a forklift, it was revolutionary; it stored more data than any previous system -- up to 5 megabytes across 50, 24-in. diameter disks coated with magnetic iron oxide paint. The system had an average seek time of 600 milliseconds. The IBM 350's disk platters spun at 1,200rpm; a pair of hockey puck-sized read/write heads affixed to a vertical shaft flew up and down the stack, stopping to read data from any of 100 tracks per platter. Within two years, the IBM 350 had doubled its storage capacity. It was a sign of things to come. Tom Burniece, a general manager at Digital Equipment Corp. (DEC) from 1981 through 1991, got his start in the industry in 1969 when he joined Edina, Minn.-based Control Data Corp. (CDC). It was one of a dozen top tech companies making drives, working to supplant IBM. The drive held up to 100MB of data. Over the decades, Burniece and his industry colleagues spent their careers mainly on one task: Finding ways to make denser and faster hard drives. It wasn't just about shrinking circuits, but about overcoming mechanical and physical limitations -- and creating industry standards. As they succeeded, data storage went from a washing machine-sized container of disks to a 3.5-in. platter that could store up to 10 terabytes (TB) of data (or a 2.5-in. drive with 2TB). Consider that 10TB could store the Library of Congress; that's the equivalent of 130 million items on about 530 miles of bookshelves, including 29 million books, 2.7 million recordings, 12 million photographs, 4.8 million maps and 58 million manuscripts. To get there, the industry had to shrink the areal density of disk platters from a few thousand bits per square inch in RAMAC's days to 1.33 trillion bits per square inch today. "That's an areal density down six to eight orders of magnitude," said Burniece, who since 2001 has chaired the Computer History Museum's Storage Special Interest Group. Prices for storage followed suit. From the time that first disk drive was manufactured by IBM in 1956, the average cost of hard drives has dropped by 41% a year, identical to the Moore's Law rate for semiconductors. Put another way: Hard disk pricing went from $2 million per gigabyte of capacity to just 2 cents per gig today. By the time Burniece got to DEC, the hard drive industry was pushing past the 1GB barrier and experts predicted drive densities would continue to double every 12 to 18 months. Not surprisingly, hard drives quickly became a standard component in the proliferating personal and portable computing systems markets. Their very ubiquity obscured the technical challenges that had been overcome. At the time, a drive's read/write heads sat just 10 micro inches off a spinning disk. (A micro inch is 1/1,000,000 of an inch.) That's hard to envision, so the industry came up with an analogy: Picture a Boeing 747 flying at 600 miles per hour six inches off the ground. That's how difficult it was to move a read/write head 10 micro inches from a platter. 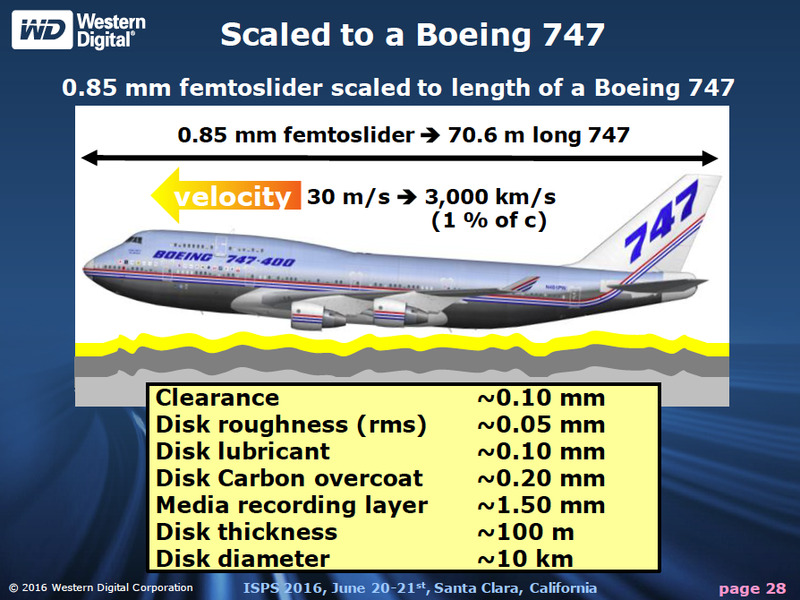 Picture a Boeing 747 flying at 600 miles per hour six inches off the ground. That's how difficult it was to move a read/write head 10 micro inches from a platter. While IBM dominated the industry in the 1960s, other technology companies saw an opportunity to manufacture their own storage, which they could also sell for less. IBM, at the time, was known for charging full retail prices -- even for bulk purchases. In 1966, Memorex developed the world's first IBM plug-compatible drive disk pack -- the Memorex 630. Not only did the Memorex 630 disk drive pack have four times the capacity of IBM's 1311 disk pack, it also cost less than half the price. IBM's 1311 sold for $27,000 with a manufacturing cost estimated to be about $1,700. While the drive was still the size of a washing machine, the loadable Disk Pack made data storage portable. Other companies began producing compatible storage for IBM's mainframe systems as well as their own. Thus was born the Plug Compatible Manufacturer (PCM) industry. But IBM wasn't sitting still. In 1970, it announced the 3330 Direct Access Storage Facility, which could be loaded with easily portable disk packs. Each pack could store 100MB of data for IBM System/370 mainframes, though it had roughly the same data transfer rate as the RAMAC -- about 806 kilobits per second. By 1972, the 10-disk removable pack had shrunk to 5 disks that would fit in an industry standard data center rack. The read/write head flew less than 30 micro-inches from platters then spinning at 3600 RPM. In 1973, IBM came out with the 3340 disk drive, which became known as the father of the modern hard drive industry. Still the size of a washing machine, the 3340 held 30MB of fixed data and 30MB of removable disk pack. It was nicknamed "The Winchester," after the historic 30-30 caliber rifle. The IBM 3340 drive had the first sealed read/write head, which kept contaminants out and allowed the distance from the spinning disk platters to drop to just 18 micro inches with an average seek time of just 25 milliseconds. Next, read part 2 of this story: The invention of thin-film heads, the rise of storage competitors, and the landscape as it exists today. Or you can download a PDF that contains both stories.